Michael Duff doesn’t make a habit of upping sticks. The 40-year-old former Northern Ireland international certainly didn’t take his first job in management on a whim. In 22 years of football the defender, capped 24 times for his country, has only ever known two clubs. After almost a decade-and-a-half at Turf Moor, representing the Clarets as both player and coach, Duff can now return ‘home’. The newly installed Cheltenham Town boss, who was weaned in to professional football at Whaddon Road as a teenager, will take charge of his first game on Saturday when Crewe Alexandra are the visitors in League Two. “It’s been a bit of a whirlwind but it’s been enjoyable and opened my eyes to a few things,” he said. “It’s slightly different because the opportunity came to me, rather than it being the ‘right time’. In football it’s not idealistic - you can’t pick and choose who and where. “There was a lot of toing and froing, conversations with family and friends and other people in the game. Ultimately we came to the conclusion that it was too good an opportunity to go home. He added: “It will be surreal, I’ve said my goodbyes to all the staff and the players. “It’s more weird for me because I’ve only left one club before. In 20-odd years I’ve only ever done this once. It is a little bit weird but it is part of the game. “To play nearly 400 games in the top two divisions has been brilliant. I can’t really put it in to words but to only have two clubs over 20-odd years is quite unique. It’s something that I’m proud to be associated with. 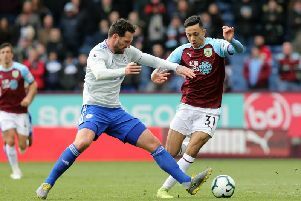 There’s no denying that Duff was one of the greatest bargains in Burnley’s history, signed by his former Robins boss Steve Cotterill for what he described as a “calculated risk”. The £30,000 capture, who had scored the goal which sealed the Conference title for Town in 1999, as they reached the Football League for the first time, went on to make 383 appearances for the Clarets, earning three promotions to the Premier League. Gary Johnson’s successor, who governed the Under 18s and Under 23s since hanging up his boots, did enough to secure a place on the Wall of Legends at Turf Moor. Duff said: “As long as I’m getting remembered for something good,” he said. “I’ve been lucky, in 20 odd years the two clubs I’ve been at have been on massive journeys at totally different levels. They’ve both been on an upward curve at different levels.